CHARLIE PARKER MADE a substantial impact on jazz, even though he died very tragically (the result of various addictions) at the age of 34. Parker was the master of “Be-Bop” saxophone, a style defined by extremely fast tempos—all the while maintaining technical perfection. Parker was never sloppy fast. He was perfect-fast. Great tone and harmonics, in addition to great logic—all poured out at a pace that to this day seems staggering. Which is why most jazz musicians considered Parker (and still do) a horn virtuoso who has seldom, if ever, been matched. And 99 times out of 100, slowing things down on the river—considering “tone” before “tempo”—is exactly the right advice to cure the flaws that hamper the fish catching situation. But there are times we should endeavor for speed. Every angler should work to make perfect casts and presentations, faster. The ability to fire out the same “money” cast, make good drifts with the right bugs, at a fast tempo is “high art.” It’s why a great angler in the back of a drift boat can still catch more fish than a hesitant and doubtful angler in the front. When you’re hopper fishing from a drift boat, the currents are ripping by, and you’re shooting casts along the bank, do the “Be-Bop hop.” You know where the fish will be: on the seams, pockets behind the rocks, drop-offs, and slack water—so hit ‘em quickly. Yes, of course, there’s sometimes reason to let grasshoppers ride slowly, languidly, down the crease against an undercut bank. But you have to pick and choose your moments, and also cover as much water, as quickly, and as perfectly as possible. 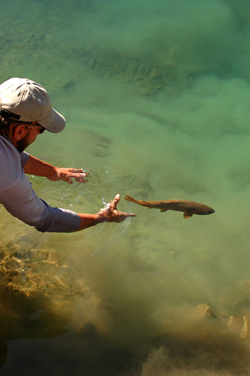 After all, and in many cases, a hungry trout is going to make a decision to eat a hopper fly within three seconds of it hitting the water, especially in fast currents. Showing many perfect presentations—even ones that last a mere second or two—will produce more hookups than the methodical, almost trepid, presentations that happen only once in awhile. I now prefer to think of it as Be-Bop jazz. Fire, drift, and work that tempo. And build up to it. Like everything else (including great jazz music), it starts with the basics—clean casts, accurate placements, honest drifts. But the more you endeavor to string those things together, at tempo, the more you’ll hone your own “virtuoso” angling talents.